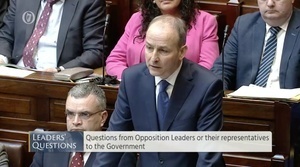 During Leaders’ Questions in the Dáil. Fianna Fáil leader Mícheál Martin raised a report by Louise Byrne on RTÉ’s Morning Ireland on Rebuilding Ireland’s Home Loan Scheme this morning. Ms Byrne reported that, according to documents she obtained under Freedom Of Information, the Department of Housing – in a briefing note dated January 31, 2019, to its press office – said further approvals are not currently being issued for these particular loans. Specifically, the note said the department “has been advised that no further approvals should issue for now”. These loans allow first-time buyers to borrow up to 90 per cent of a property’s value from their local authority. Those wishing to secure one of these loans have to show they’ve been turned down for mortgage approval by two banks. In light of Ms Byrne’s report, Mr Martin said Fianna Fáil TD Willie O’Dea was told in December 2018 by the Minister for Housing Eoghan Murphy that “he was progressing reforms to ensure the loan can work for more people and more quickly”. “I don’t know what planet the minister is on? But the question I would ask Taoiseach is: Why wasn’t the scheme extended? Why hasn’t it been extended? Why was there no public announcement to the effect, in other words, if you tell your press office, surely deserve the public deserve to know? 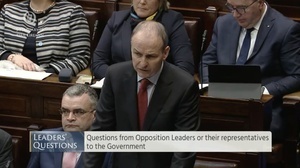 “And why wasn’t the Dáil told: upfront and in an honest way? “Why this kind of continuing lack of respect for the House? In terms of being open, upfront and honest in terms of what is going on? In terms of schemes of this kind? 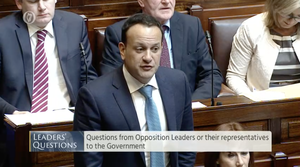 Mr Varadkar told the Dáil 575 people have secured loans under the scheme to date while a further 1,000 applications have been approved but the money has yet to be withdrawn in respect of those. He said the scheme was initially limited at €200m and that figure has been allocated. “But as loans are not drawn down and loans do expire after six months, if they’re not drawn down, more finance does become available. In response, Mr Martin asked Mr Varadkar when he discovered that the Department of Housing had to do these two things. Mr Varadkar told Mr Martin – after Mr Martin accused him of prancing about the place – “while you’re prancing about the place and wagging the finger and telling us off, we’re actually doing things, doing things in the real world that help people”. He said the Government has helped 10,000 people buy their first home. 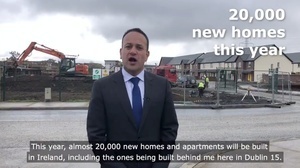 Posted in Misc and tagged Housing, Leo Varadkar, Loans, Micheál Martin at 2:32 pm on March 5, 2019 by Bodger. do you think he really believes this? Varadkar can never answer a criticism with any degree of integrity because he cannot handle ANY criticism at all and by way of response always reacts with insults. he has a very fragile ego. 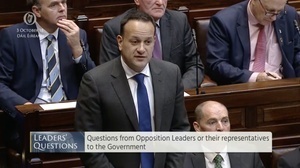 martin asked him straight forward questions about something serious and he just responds basically saying “no, you’re just a nay sayer, and fine gael are great and we do great things” .. im sick of his disdain for anyone who questions his governments careless rule. He does have an attitude. He doesn’t strike me at all like someone who can meet opponents in the middle and take criticism. Does appear that way – how many times does he answer a genuine question with either a (as he see’s it) witty quip, bringing up whataboutery or listing figures monotonously? I’d say he cries reading his twitter feed and would love to seriously clamp down on freedom of speech. Also, can I get a pro FG shill to have a little cry about we are always giving the man a ‘hard time’ when he so clearly deserve way more criticism than he gets? Remember, this is the guy who sympathized with Trump about the media reporting on stuff they do. his responses are always so b!tchy, and always just trying to smarmily take down critics. 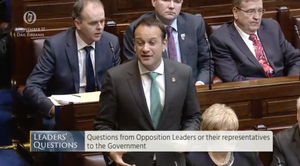 like the trump/media comment, he was annoyed because it was literally reported that varadkar had failed on a number of issues, so he was using a question about trump as a way to have a hissy little swipe at irish media. he’s already publically aired ideas about having power to delete what people say on social media. he’s very egotisitcal and really doesnt have the level head of a leader. he’s more into the idea of being a leader than actually leading. This government is all about appearances, everything is smoke and mirrors, they say all the right things but never follow through. Heh. You said follow through. Heh. Local authorities lending people money to buy houses in a bubble? What could possibly go wrong with that? As much as I loath FF and FG I think this scheme is not a good idea.